List of elementary streams, indexed by PID. Map of stream descriptions: key=PID, value=stream_description. 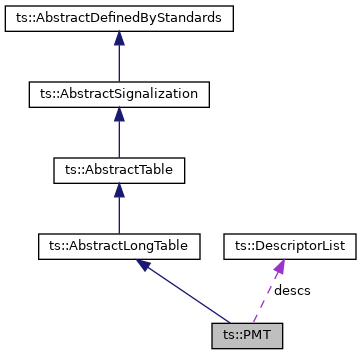 Representation of a Program Map Table (PMT). [in] version Table version number. [in] is_current True if table is current, false if table is next. [in] pcr_pid PID of the PCR. Default: none. [in] other Other instance to copy. Constructor from a binary table. [in] table Binary table to deserialize. Search the component PID for a given component tag. [in] tag Component tag to search. The PID of the corresponding component or PID_NULL if not found. Search the first video PID in the service. The first video PID or PID_NULL if none is found. 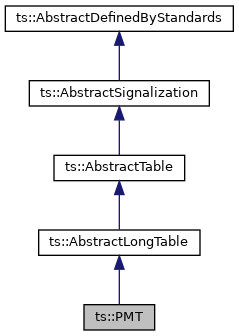 A static method to display a section. [in] section The section to display.